I’ve long argued that we need to account for inflation with our retirement income plans. Many disagree arguing that we spend less as we get older. Retirement income planner, Daryl Diamond, argues that both extremes are wrong in his book Your Retirement Income Blueprint. He plans for retirement income purchasing power to drop by 25% at age 75. I don’t see much sense in arguments that we can plan retirement spending based on constant dollars. Even at 2% inflation, why should we expect a retiree to want to spend 10% less only 5 years into retirement? An elderly couple in my extended family have seen inflation triple prices since they retired. They are struggling with trying to live on only one-third of their former consumption. Daryl Diamond says “retirement income projections that do not adjust at all for inflation or that are fully indexed through retirement are both in error.” He indexes spending plans up to age 75, then drops spending by 25%, and resumes indexing thereafter. I’m not convinced that most retirees will want to spend 25% less when they reach age 75, but at least this is a more sensible strategy than ignoring inflation entirely. Unfortunately, this 25% drop is self-fulfilling if it gets planned in. Retirees on Diamond’s plan will have to reduce spending whether they want to or not. Otherwise they risk running out of money. Diamond’s preference is to start with a 5% withdrawal rate rising with inflation with the one-time 25% reduction at age 75. He says this “has proven to be quite resilient in the face of negative markets over the last 25 years.” He goes on to show some 22-year scenarios (riddled with small calculation errors) based on real market returns starting in 1992. How can experience over 25 years give much insight into whether retirees will run out of money over 30+ years of retirement? Diamond says “I know this example does not go back and review a hundred years of data.” Unfortunately, it doesn’t even cover a full retirement for a typical 60-year old couple. For some reason, none of Diamond’s scenarios include the 25% spending reduction at age 75. So, they are testing a 5% withdrawal rate indexed to inflation with no reduction. As an experiment, I reordered the returns in one scenario to begin in 2008 and after 2013 wrap back to 1992. At an indexed 5% withdrawal rate, the retiree ran out of money in the 23rd year. Diamond has not persuaded me change my conclusions from recent withdrawal rate experiments. Anyone retiring at 60 or 65 who pays typical investment fees is taking a chance even withdrawing initially at 4%. As for the 25% spending reduction at age 75, it may make sense to let each retiree decide whether to include this as long as the question is framed in a way they can truly understand. This whole business of withdrawal rates reminds me of times when my boss wanted me to collect information to make some important decision. In reality, my boss knew which choice he wanted and this was really an exercise in justifying that choice no matter the truth. With withdrawal rates, retirees play the role of my boss, and advisors play my role. Retirees want as much retirement income as they can get. Advisors have to justify higher withdrawal rates somehow or risk losing clients. After all, will you pick the advisor who says you can spend $5000 per month or the one saying $3000 per month? Fortunately for advisors and unfortunately for their clients, the result of over-consumption won’t be obvious for many years. The well-known 4% rule for retirement spending comes from a 1994 paper by financial planner William Bengen called Determining Withdrawal Rates Using Historical Data. Some time ago I repeated his experiments adding in the effect of portfolio fees. This time I include mortality tables so we can see the effect of retiring at different ages instead of using Bengen’s target of a 30-year retirement. Bengen’s model was to choose a fixed withdrawal rate at the start of retirement and increase the dollar amount by inflation each year regardless of how your portfolio performs. There’s a lot to be said for adjusting your spending based on portfolio returns, but Bengen’s goal was to find a safe withdrawal rate where you wouldn’t have to cut spending. He found that for stock allocations from 50% to 75%, a starting withdrawal rate of 4% (assuming no portfolio costs) was safe for a 30-year retirement. Here I use mortality statistics from the Society of Actuaries to better model longevity and varying starting retirement ages. Bengen’s 30-year retirement is too short for most 50-year olds and too long for most 80-year olds. I based the experiments on a century of U.S. stock and bond returns from 1914 to the end of 2013 (using Robert Shiller’s online data). I averaged the results of 100 retirees starting each year during the century. For retirements extending beyond 2013, I wrapped back around to 1914. 1. Retirees are single males, single females, or a male-female couple of the same age where I used “joint” statistics. 2. Acceptable probability of running out of money. 3. Age at the start of retirement. 4. Portfolio costs each year. 5. 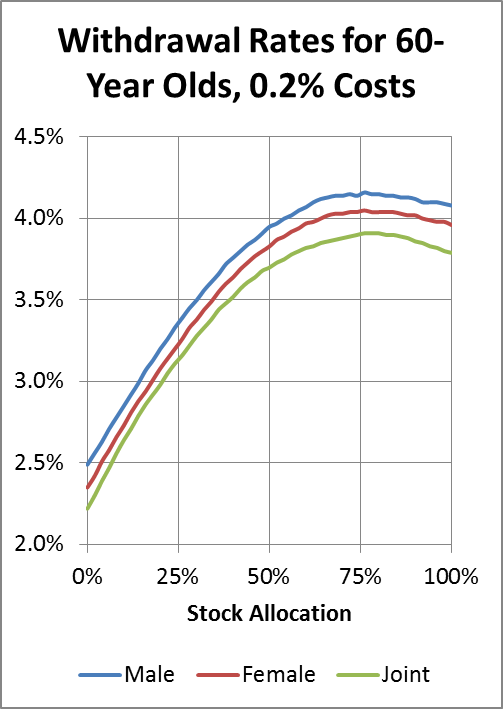 Stock-bond allocation in the retirement portfolio. The output from each simulation is the starting withdrawal rate that gives the desired probability of running out of money while still alive. In the case of a couple, the withdrawal rate is considered a failure if either person outlives the money. Unless otherwise stated, the default inputs are a 5% chance of running out of money, 60 years old, 0.2% portfolio costs, and a portfolio holding 75% stocks and 25% bonds. I used 0.2% portfolio costs because that is the total of my own portfolio’s expenses (MERs, trading expenses within funds, commissions, spreads, and foreign withholding taxes). Most portfolios have much higher costs than this. 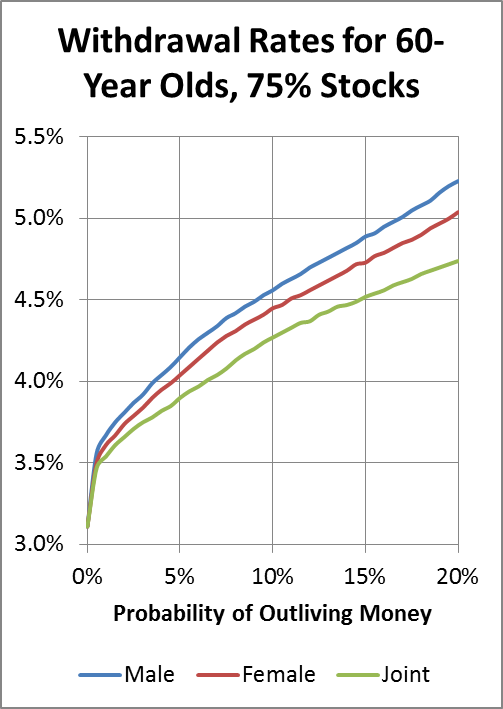 In the first experiment, I examined how the safe withdrawal rate varies with age. As we see from the following chart, when stock allocation is 75% and total portfolio costs are only 0.2% per year, the simple 4% rule is appropriate for 56-year old males, 59-year old females or 63-year old couples. However, when portfolio costs rise to the more typical 2.5% per year, the following chart show that the ages for a 4% rule rise to 72 for males, 75 for females, and 77 for couples. Keep in mind that these results are based on historical U.S. data and that most experts expect future real returns to be somewhat lower than they were in the U.S for the past century. 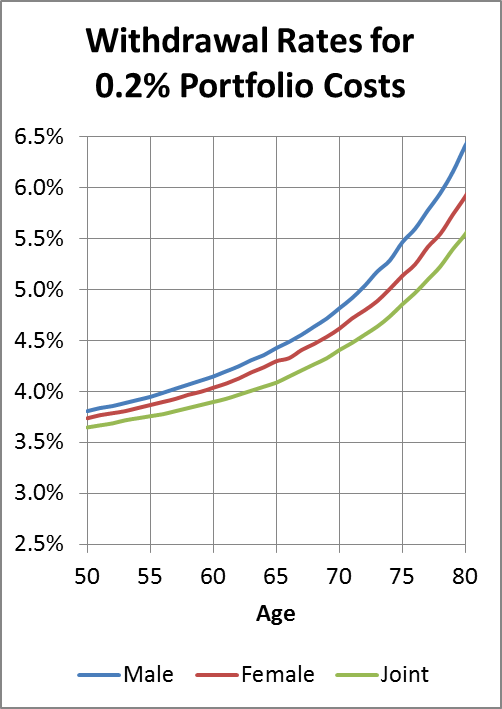 Early retirement enthusiasts should make note that the safe withdrawal rate for 50-year olds is about 2.7% for males, 2.6% for females and 2.5% for couples. These rates go up to about 3.7% to 3.8% for rock-bottom portfolio costs of 0.2%. So, for those retiring at 50 or earlier, the 4% rule just doesn’t apply unless you’re prepared to make deep spending cuts as necessary. 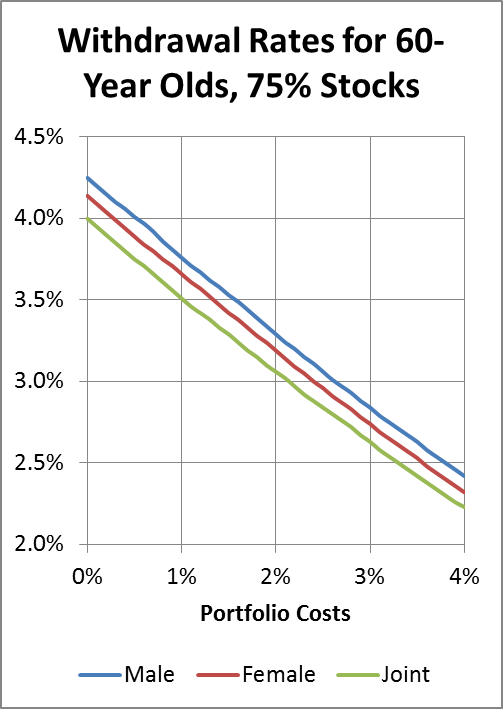 In the next experiment, I examined how the withdrawal rate changed with the portfolio’s allocation to stocks. Recall that the default inputs were a 5% chance of running out of money, 60 years old, and 0.2% portfolio costs. As we can see from the following chart, the highest withdrawal rate comes with a portfolio of about 75% stocks and 25% bonds. 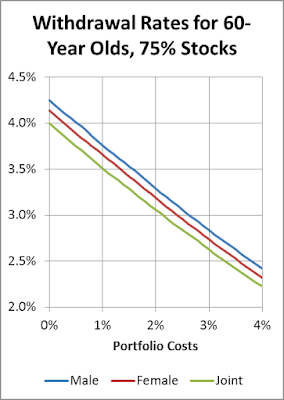 It’s just common sense that withdrawal rates must be lower if portfolio costs are higher, but for some reason almost everyone ignores portfolio costs when talking about the 4% rule. It’s possible to be too pessimistic here, though. At first it may seem that 1% portfolio costs would take us from 4% withdrawals to 3% withdrawals, but this isn’t correct. When we’re at risk of running out of money, portfolio costs apply to an ever-shrinking portfolio. This reduces the dollar amount of these costs. 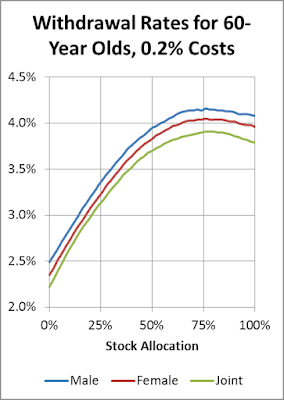 As the following chart shows, each 1% of portfolio costs reduces the safe withdrawal rate by about 0.44%. Some retirees may not be happy with a 5% chance of running out of money. 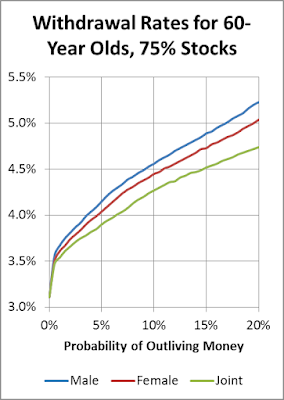 The following chart shows how the withdrawal rate varies as we change the chances of outliving your money. 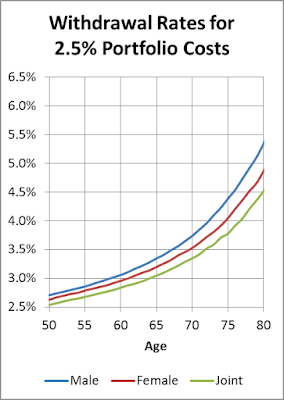 For 60-year old retirees who want a portfolio that would have lasted until age 120 for any starting year in the past century, the safe withdrawal rate is 3.1%. 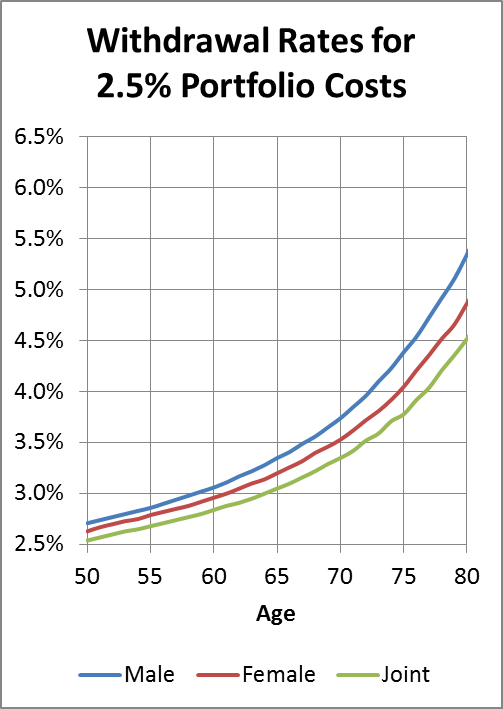 At the other extreme, 60-year old males who can tolerate a 20% chance of running out of money can have a starting withdrawal rate of 5.2%, as long as their portfolio costs are only 0.2% per year. This makes a mockery of common advice from financial advisors to withdraw 5% from portfolios whose total costs are typically above 1.5% per year. These results can be depressing for the many retirees who don’t have large enough portfolios to generate the income they want. Many otherwise excellent financial advisors seem prone to telling these retirees what they want to hear – that they can withdraw 5% or 6% from their portfolios each year. This is a formula for a few good years of retirement followed by relentless spending cuts for decades. It’s possible to start retirement by spending a little more than the withdrawal rates calculated here if you’re prepared to cut spending as necessary. However, it’s important to be realistic about how deeply you can cut. I’ve watched people fail to cut enough early on and end up with no savings. My own attempt to design a spending strategy in retirement is called Cushioned Retirement Investing. The main idea is to use fixed-income cushioning to reduce how much you have to cut spending if portfolio returns disappoint. There are many ways for new retirees to justify spending more right away. Who needs to spend a lot when they’re 90? Unfortunately, a 60-year old retiree who spends too much could be cutting back sharply as early as age 65. It’s much better to make a realistic plan and in the happy event that stock markets soar, you can always find ways to spend more.